A deceptively simple wingsuit game. Glide through procedurally-generated mountainscapes and score points by passing near surfaces and through narrow gaps. Each run continues until you crash against a surface, but you can immediately restart. While it only takes a few minutes to get a sense for everything the game has to offer, it’s a game you can keep playing for a very long time. The game is very easy to pick up, with directional steering being the only real controls. The goals are clear and continually present the player with risk/reward tradeoffs. The physics are intuitive and the motion blur and wind sounds sell the feeling of speed. The visuals are low-poly, but that keeps the game running smooth and snappy. In motion, everything looks great - though I do wish I could tweak or replace the textures on the player character itself. 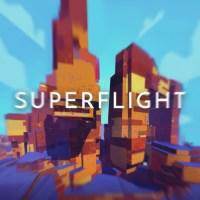 You can play Superflight as an intense score attack game with a high skill ceiling, but impressively it also works as a relaxing and meditative experience. Your score is just kind of there (and you can even toggle on “Zen mode” to hide it during flights) rather than being any kind of barrier to progress. You don’t have to hit a score target to unlock the next level, or pass through designated gaps in the mountains - an endless number of varied landscapes are freely available to you at all times and you can chart your own paths through them. The real-feeling physics and absolutely spot-on wind sounds make it easy to immerse yourself and enjoy the freedom of flight. The procedural generation keeps things fresh and crashing is just a brief interruption rather than a punishing fail state. There isn’t a lot here and it wouldn’t work if it didn’t feel amazing. But it does. I Stopped Playing When: After playing intensely for about an hour and getting the hang of it, I’ve slowed down but not stopped. Chasing high scores isn’t appealing to me, but it’s still a good way to relax. It’s not uncommon for me to fire it up for a few minutes in the evening.